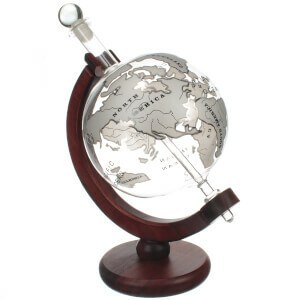 The Glass Globe Whisky Decanter is a highly unusual and innovative decanter that will certainly provide a talking point. Crafted from hand blown borosilicate glass in the form of a globe, the decanter can gently spin on an ‘axis’ within its glass cradle. With a generous 700ml capacity and a glass ball stopper with an airtight seal to keep the contents fresh, you can hold the whole world in your hands as you pour your favourite tipple. I bought this for a Christmas gift. I was very pleased with it when it arrived, just hope my friend like it as much. This was a very good buy, it's different and the perfect gift for any male between 21-75 years. It looks good enough to have on display even if they don't drink alcohol. It's even lovely with blue water as that showcases the world. First of all I have to say the delivery was fantastic. I ordered at approx 8pm last night and the parcel was delivered to a neighbour at 10am this morning. (Standard free delivery) The box is so light I started to worry they might have forgotten to pack it but on opening it was there. The decanter is much smaller than I expected it to be but it will hold a 70cl bottle. It does look amazing but is going away for my husbands Xmas present so won't be using yet. So far I am pleased with this. Received this after very fast delivery, however was very disappointed. The product is so light, the glass is so thin that I don't think it could ever be used as a decanter even occasionally. The description says it holds 1L however the box says 0.7L. The map is squashed onto the glass in white paint, the picture does not show this accurately. All in all a poor quality product on my opinion. I ordered this for a Christmas present in 2016, however, it was out of stock. I have subsequently re-ordered ready for Christmas 2017 and I am not disappointed. The quality of the product is great and it looks fantastic. The details in the frosted glass are lovely and it really does look like it's more valuable than it actually is. I would highly recommend this as a gift for a man who is difficult to buy for as the workmanship is fantastic and overall it is just so different to all the other decanters on the market and at a really reasonable price. 5 very happy stars. My husband was delighted with his Christmas Gift of Glass Globe Whisky Decanter. It has been well admired already and although looks quite small it hold plenty of whisky and is actually more robust than it looks. Good gift and good price.